The war goes on… | America loves Sporks! Now that I’m not spending time on testing desktop players, I have more time to fix things making this easier to deal with. I know an IP address, but until now I may not know much more and it was time consuming. 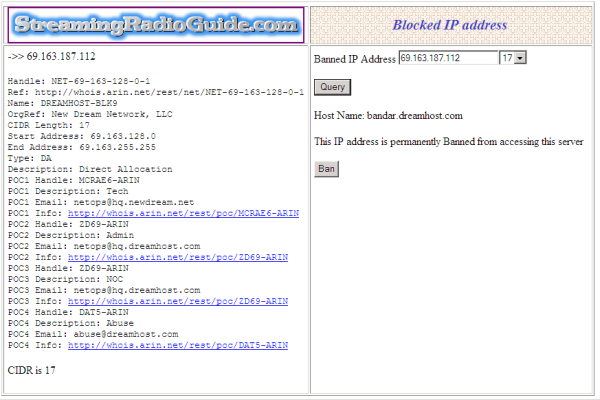 In this specific case, reverse DNS lookup volunteered that this is a web server at a place called DreamHost. Web servers should not be accessing this server for data without permission, so I want to ban all web servers at Dreamhost. Based on that IP, I found out who actually controls it – and if I was so inclined to send an email to DreamHost to let them investigate if one of their customers did this on purpose or if their customer’s web server has been hacked and they don’t know it yet. So now I can list on my resume that I have used JSON. I didn’t actually do anything other than copy/paste code and tweak it a little – but hey, if copy/pasting the first paragraph of Rosa Parks’ autobiography gets you an A- if you’re a college athlete, I think I’m entitled too! “bandar” could be owned by China, or it could be owned those folks who used to live in the sandy deserts, but who know live in ultra-modern, air-conditioned, Ivory towers that your petrol dollars paid for. — By the way, let’s ban all that ‘frackin’. Add to that the little tidbit that many common legal pharmaceuticals are now produced in India. The line between legal and illegal can be pretty hard to see. Even today, people are still consuming significant quantities of unlicensed Dihydrogen Monoxide in this country without a prescription. The pure stuff is hard to get. …. normally it requires a distillation process.